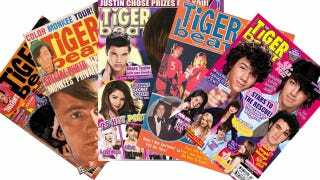 Charles Laufer, the founder of Tiger Beat died recently. It reminded me of how I wound up posing for the teenybopper bible. I'd never seen an issue of Tiger Beat when I met Allison Tanenhaus at an accepted-students weekend at the college we both wound up attending. The name was a synecdoche for all things perky and fervent — which, by the time I was seventeen and bonding with Allison over our love of Le Tigre, didn't seem to have much to do with us. She went to the kind of high school that required seniors to do internships. Hers, at Tiger Beat, was combination irony and contrarianness, but the editor-in-chief, Allison told me recently, wasn't at all ironic about her love for LFO, and who called herself 'a professional teenager.'" When the editor went for Allison's pitch about bedazzling, I joined her friend, the singer Marianne Nowottny, to pose for it. A friend of Marianne's shot us in somewhere in New Jersey; they ran a photo of the three of us on the Bedazzling page, and I shared the table of contents with James Vanderbeek. (Click to enlarge). That issue, August 2001, has 'N Sync on the cover. It offers the opportunity to "Take a trip to Camp Britney" and promises 187 "pix and pinups." (Each headline was meticulously tested. Allison says, "At one point they had some other interns go to a nearby school after class let out to survey some of the girls, to see if they knew what "suave" was. Most thought it was shampoo, so we knew we couldn't use it as part of a headline.") I don't remember why we we were so angsty. That's what it was always about, I think. Not our pix, of course (see above), but of floppy-haired, fresh-faced boys, boys even when they were men, highlighted and occasionally goateed, at least in those days. Even by that time, younger girls could fulfill online that urgent desire to look. I remember distinctly that the first thing my sister and I searched on Prodigy's early Internet search was photos of Tori Amos, which we patiently watched assemble bar by bar on an old dial-up. We bought magazines like Spin and Rolling Stone not for the words but for the pictures, and hungered for new ones. These magazines aren't dead — some are promising retailers they'll feature Justin Bieber in every issue. But that urgency, born of scarcity of constant images, in a controlled time that was innocent in representation, if not reality, is gone. "Let's face it, we're in the little girl business," Laufer once said, the very formulation anachronistic in a time when we talk a lot more about more sinister kinds of "businesses" in little girls. Still, it's interesting to think about how much of that business, for Laufer and the people he sold the magazine to, was about looking, when we're still told that men and boys are the ones who like to look.